A-HOTEL.com - Luxury and cheap accommodation in Sok-Karmalinsk, Russia. Prices and hotel, apartment booking in Sok-Karmalinsk and surrounding. Situated in Kamyshla, Hotel Novyi Zamok provides air-conditioned rooms with free WiFi. Featuring a 24-hour front desk, this property also provides guests with a children's playground. Situated in Buguruslan, Paris Hotel provides free WiFi. Boasting a 24-hour front desk, this property also provides guests with a restaurant. Apartment on Kommunisticheskaya 37 is set in Buguruslan. This property offers access to a balcony and free WiFi. На Красногвардейской is located in Buguruslan and offers a garden. This apartment provides a terrace. Apartments on Saidasheva 3 is located in Bugul'ma. Guests staying at this apartment have access to free WiFi. Gostinichny kompleks Bugulma features accommodation in Bugul'ma. All rooms boast a TV with cable channels and a private bathroom. Apartment on Krasnoarmeyskaya 37 is situated in Bugul'ma. Guests have access to free WiFi. Двухкомнатная квартира is set in Bugul'ma. This apartment also has free WiFi. Malay Inn offers accommodation in Bugul'ma. This 2-star inn offers a 24-hour front desk and free WiFi. Situated in Bugul'ma, Lilia Inn offers accommodation with free WiFi, seating area and a kitchen. Fitted with a balcony, the units feature a flat-screen TV and a private bathroom with bath and free toiletries. Located in Bugul'ma, Mini Hotel Plazma provides free WiFi. All rooms boast a flat-screen TV with satellite channels and a private bathroom. Hotel BEST is located in Bugul'ma and features a shared lounge. All rooms boast a TV with satellite channels and a private bathroom. 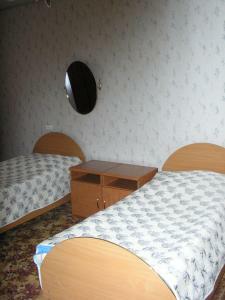 Hotel Akvamarin offers accommodation in Leninogorsk. Guests can enjoy the on-site bar. Oasis Hotel features accommodation in Leninogorsk. All rooms boast a flat-screen TV with cable channels and a private bathroom.